08-Feb-2004 -- Last December, Tom reported our visit to CP 1°S 117°E. This was the first successful confluence visit on the island of Borneo (the only other one, in Brunei, was classified as incomplete). That point is about 20 kilometers north of Balikpapan, the town where we both work (for different employers). The next confluence to visit was logically the one south of Balikpapan, 2S 116E. On Christmas day 2003, having nothing better to do, I had driven there to check how close I could get. I had reached 4 km due West of the CP, but had given up for lack of time. On Sunday February 8, 2004, we left my house at 6 am, heading south. The first hurdle is to cross a large bay on the south side of Balikpapan. There are ferry boats that run between Balikpapan and Panajam, on the south side. At 8:20 we got off the ferry at Panajam and started our trip south on the only paved road that runs along the east side of Borneo. We left the main road about 110 km later at Kuaro, heading towards Tanah Grogot and left that road again about 5 km later to follow a good gravel road for another 25 km. This took us to the village of Suweto on the west bank of the Kendilo river. This river runs east the straits of Makassar, but at that points it flows due north. A brand-new suspension bridge spans the river but it looks like it has never been used. There is a good reason for that: the road stops on the other side of the bridge (Figure 6). The bridge is about 4 km due west of the confluence point. At 11:15 we got the mountain bikes and back packs out of the car and started off. First we rode north along the river to check if there were any path we could follow, but after a few hundred meters through banana groves we could go no further. We tracked back and found a small trail going east, in the right direction. It goes up a ridge and on the other side there is a large hilly area that has been cleared and is planted with sugar cane (Figure 7). In the distance, beyond the fields, it is all virgin forest. After a few hundred meters it became clear that the bikes would not help us much. When the area was logged, all sort of debris was left on the ground. These small logs are easy to step over but they make riding almost impossible. So, we dropped the bikes and continued on foot. We soon reached the end of the cleared area and asked a farmer if there was a trail through the forest. Where are you going? This was hard to answer because there is absolutely nothing beyond that point, as we found out later. I just said I wanted to go three or four kilometers towards the east. The man told us that there is indeed a path and showed us where it starts at the edge of his field. From that point on, we were in virgin forest. The good thing is that we were sheltered us from the sun, although it was still very hot and very humid. The bad thing is that we were losing GPS signal very often. Figure 10 is a plot of the trail we followed. 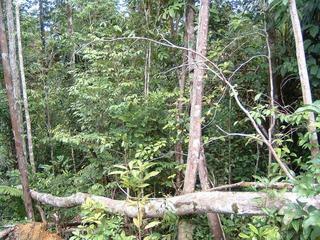 The middle third is all under thick forest cover, as can be guessed from all the gaps on the line. For a few kilometers we followed a narrow, ill-defined foot path that winds its way through the forest, going left, right, up and down, crossing an occasional small creek. Once in a while there was a clearing and GPS signal was restored. Here and there, small patches had been logged and we practically had to crawl under the bush that grows back in these cleared areas. Eventually we reached a large area that has been logged and came across a wide path, which must have been a logging road a few decades ago. Obviously, no vehicle has been there for ages because there are no traces at all and vegetation is growing back. Yet, whatever little soil there was initially has been stripped away and not much grows on that trail. This made walking a lot easier. We followed that "road" first north and then east again. This road took us to about 80 meters south of the confluence. The north side of the road has not been logged and vegetation there is very dense. It was impossible to get to the confluence directly from the south, so we tried first from the east, with no succes, then from the west with more success. However, whenever we got closer than about 40 meters we were under thick canopy and all signal was lost so that we could not get accurate coordinates. We settled for a small clearing about 50 meters west of the confluence, where we could get three satellites and we took the pictures there. We then headed back towards the car, which we reached about 5 pm. We had walked about 13 kilometers altogether. The day was not over yet. At Panajam, there was a long line of cars and trucks waiting for the ferry. We could not get on the first two ferries but the third was the good one. We were back home slightly after midnight, tired but very pleased with our successful hunt.